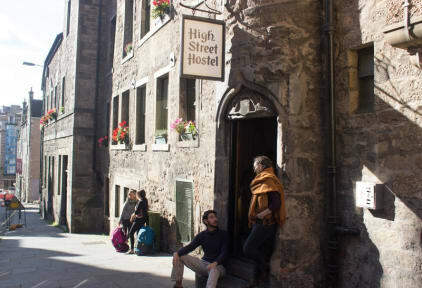 High Street Hostel i Edinburgh, Skottland : Boka nu! Lovely atmosphere, nice staff and really nice kitchen with everything you could need for cooking. Can’t think of any complaints. Great place slap bang in exactly the area you want as a starting point to explore the city, friendly staff, awesome details such as two power sockets as well as a personal locker (with a key, no padlock needed) next to every bed, bedding included, supercheap breakfast available, wifi that ACTUALLY WORKS in every nook and cranny of the place - and simply overall amazing value for your money. Recommended! Excellent location. Very friendly and helpful staff. Clean rooms. Breakfast is OK but cheap. I will most certainly stay here again if back in Edinburgh.